Christmas is just a little over a week away. That means it's time to make yourself look and feel younger and better for all those people you only see once a year. For me this means trying to hide some of those gray hairs that seem to be multiplying. In the past, it has been hit or miss with hair coloring for me. Sometimes the color doesn't work with my dark hair. Sometimes the product doesn't cover my stubborn grays. And sometimes I don't like the texture of my hair after it's been colored. This time, I went to Clairol.com to use their Full Hair Color Shade Palette to choose a shade I liked. There I was greeted by Angela Kinsey's (from NBC's "The Office") friendly face. I've always liked reddish highlights in my hair. Last time I tried an auburn type red and did not care for it so much, so this time I chose Rich Burgundy, which is a cooler color than the warmer auburn. Although, it is difficult to see in the photos, this color took to my hair very well. Before coloring, my hair was a black/brown. Now the color is much richer, although you can only see the burgundy in the sunlight. The color covered most of my gray hairs, which are usually thick and wiry. Those strands came out deep burgundy so they do not stand out as bright red or copper against my dark hair. I was also very pleased with the texture of my hair, which was thick and shiny rather than limp. One thing that I do want to point out is that Clairol (and the other leading brands of hair color) may want to consider including a second pair of larger gloves in their kits. I know I cannot be the only woman whose husband helps her with applying hair color. The gloves included barely fit anyone with larger hands and they tear easily when stretched. 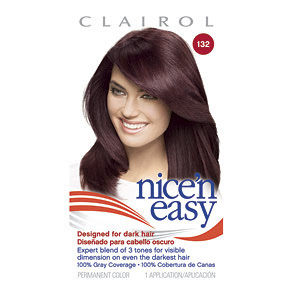 You can find Clairol products most places where hair coloring kits are sold. What color would you choose for your hair? 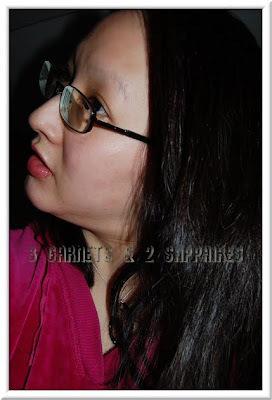 Thank you to Clairol for providing a hair coloring sample kit for this review.